On this day, the 16th of November, in 1885, Louis Riel was hanged in Regina, the capital of the Northwest Territories at the time and the headquarters of the North West Mounted Police. During that year, Riel led Métis people in the Northwest Resistance (or Northwest Rebellion depending on which side you were on), which was a stand against the Government of Canada because it was encroaching on Metis rights way-of-life. The Métis were defeated at the siege of Batoche and the Canadian government captured Riel. 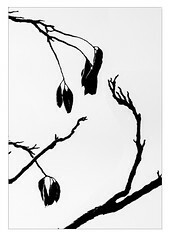 He was eventually put on trial where he was convicted of treason and executed. As a result, Métis people across Canada were labeled as traitors and for generations many felt the need to hide their Métis culture and heritage. Riel had previously led the Métis in the Red River Rebellion of 1869-1870. In 1869 Canada bought Ruperts Land from the Hudsons Bay Company (Ruperts Land covered most of what is now western Canada). The end result of this rebellion was the formation of the province of Manitoba under the Manitoba Act of 1870. The Act included some of Riel’s demands such as separate French schools for Métis children and protection of the Roman Catholic religion. Manitoba was a small piece of what was once Ruperts Land. A little province surrounded by a large Northwest Territory. History is often difficult to condense into a couple of paragraphs but there is a lot of information about Riel and the history of western Canada on the internet if you are interested in learning more. Now, the 16th of November is Louis Riel Day, a day to look to the past and remember what Riel stood for. 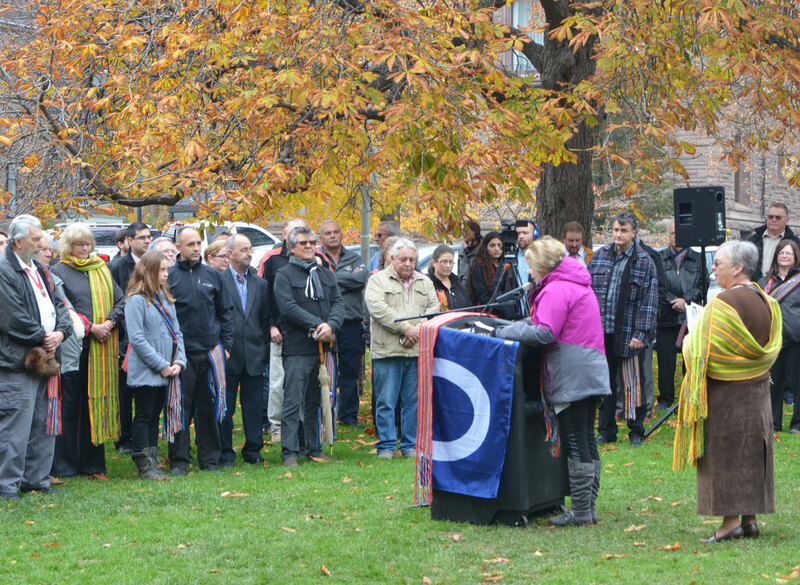 It is also a day to look at the present and to recognize the many contributions of the Métis to Canada and to highlight the continuing struggles that Métis continue to face. 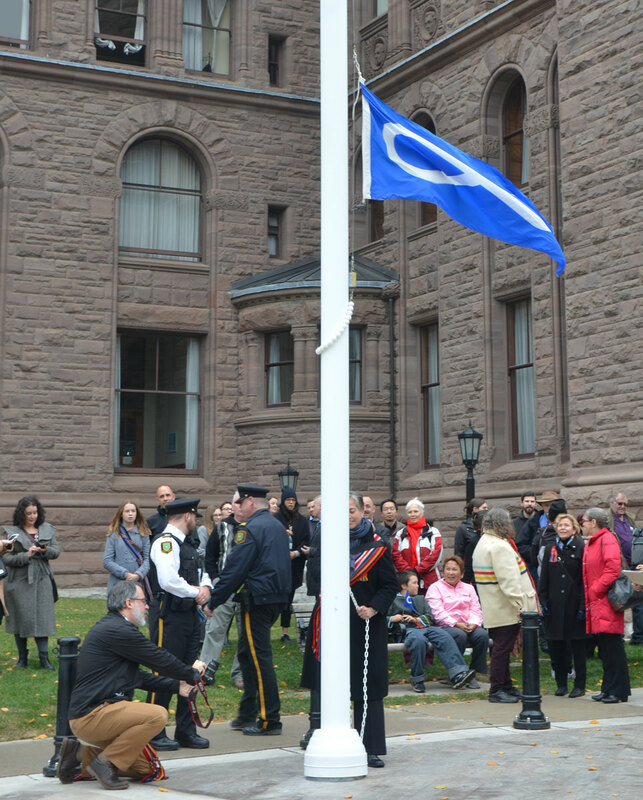 below: The Metis flag is raised in front of the parliament building at Queen’s Park. The flag features a large white infinity symbol and the background can be blue or red. The infinity symbol can be seen as a representation of the faith that the Métis culture shall live on forever and/or the joining of two cultures to form one. 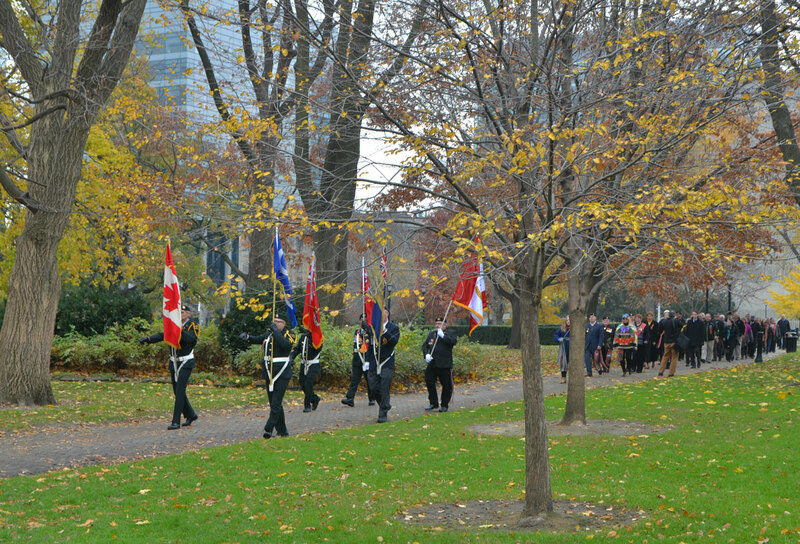 below: After the raising of the flag, the colour party leads the procession through Queen’s Park . below: People congregated at the Northwest Rebellion Monument. This monument honours the 43 men who fell on the battlefields in 1885. 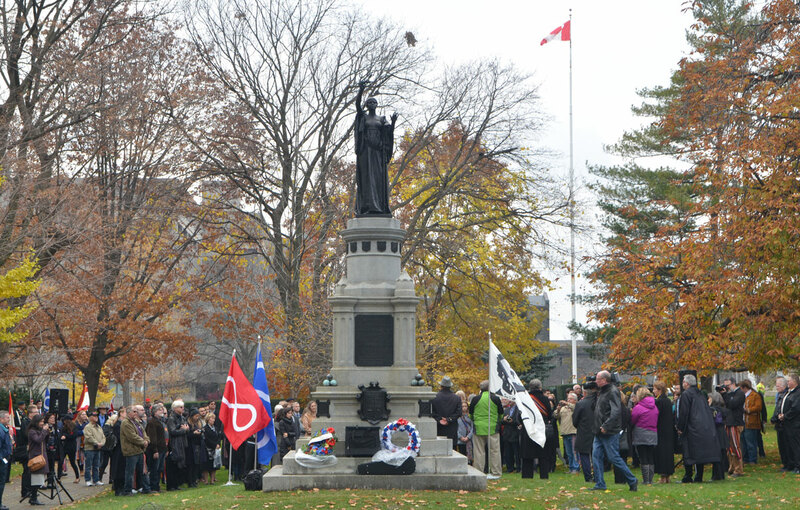 There is no reference to the Métis defenders who also died during the resistance or the Métis desire to negotiate. It reflects the widespread belief that the Métis were traitors, an idea that was prevalent at the time the statue was commissioned. It was unveiled in 1895; the figure of Peace on the top of the monument was sculpted by Walter Allward. Since its inception in 1993 the Metis Nation of Ontario has used this monument as the focal point for its Louis Riel Day ceremony. 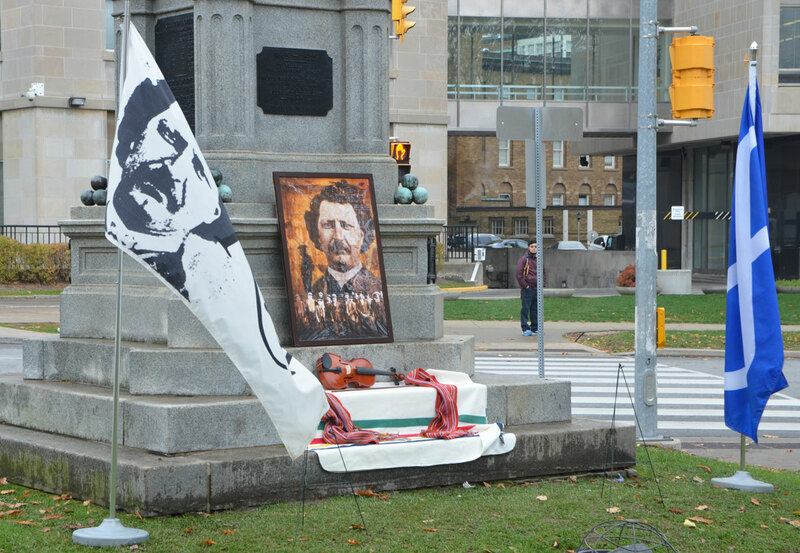 below: The base of the Northwest Rebellion memorial is decorated with a picture of Louis Riel along with Metis flags, Metis sashes, a Hudson Bay blanket and a violin. below: Senator Verna Porter-Brunelle opened the ceremony at the base of the memorial to the Northwest Rebellion. 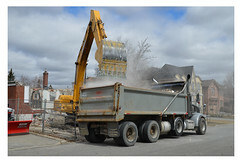 Other government speakers included the Speaker of the Legislative Assembly of Ontario, Dave Levac as well as the Minister of Indigenous Relations and Reconciliation, David Zimmer.